It is with great sadness that we share with you that David Brydon passed away Monday, June 11, 2012 at the Boone Hospital Center, Columbia, Mo. 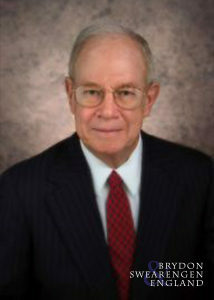 Mr. Brydon recieved his license to practice law in 1963 and immediately began the practice of law in Jefferson City with Thomas Graham and Robert L. Hawkins Jr. David practiced his entire career at 312 East Capitol Avenue until his retirement on February 29, 2008. The law firm: Brydon, Swearengen & England P.C. that was started with three original members now has fifteen lawyers. David’s successful legal career was vast and varied. He was an AV Preeminent Peer Review Rated attorney. In addition to serving his clients during their times of need, he also served his community as Assistant Prosecuting Attorney for Cole County. He was certified to practice law before the United States Supreme Court on March 17, 2008. David was a life long member and Elder of the First Presbyterian Church working mainly with young people. He actively worked with the Cole County Historical Society, serving as President and as a member of the Board of Directors of the B. Gratz Brown Foundation. He served as Chairman of the Conservation Foundation of Missouri Charitable Trust, President of the Cole County Bar Assn., and President of the Missouri University Fraternity Counsel. Visitation will be at the First Presbyterian Church from 11:00 AM until 1:00 PM Friday, June 15, 2012. Funeral services will be conducted at 1:00 PM Friday, June 15, 2012. In lieu of flowers, memorial contributions are suggested to the First Presbyterian Church, 324 Madison Street, Jefferson City, Mo. 65101 or the Conservation Foundation of Missouri Charitable Trust, 728 West Main Street, Jefferson City, Mo. 65101.